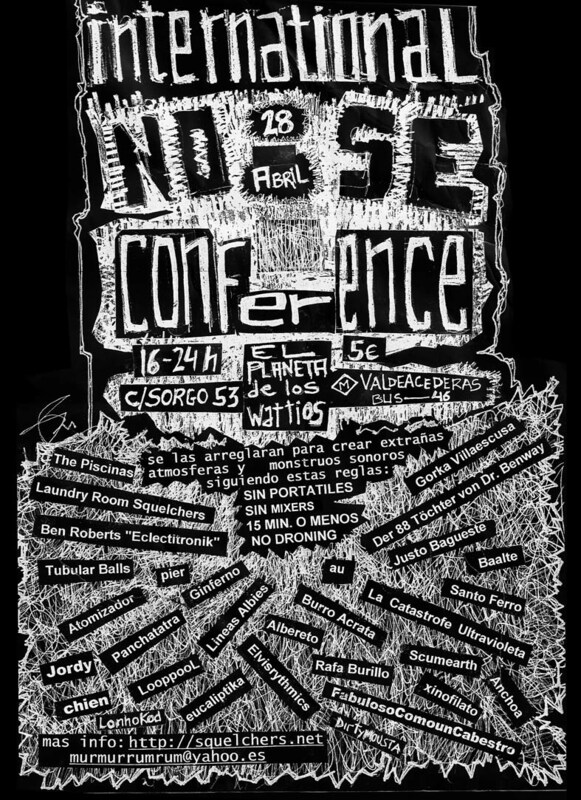 Conceived especially for International Noise conference Madrid 09, in which performers are given a 15 minute ‘slot’ on the bill, and adhering to 3 other basic rules. The 15 minute rule can be seen here as a reference to Warhol’s 1968 statement: “In the future, everyone will be world-famous for 15 minutes”, a sentiment which is reflected by contemporary multimedia corporations with endless formatted TV ‘fame schools’, ‘talent’ shows, ‘’reality tv’ shows and ‘star academies’. As the competition between broadcasters and shows increases, the intensity of the search for a ‘new face’ hits an all-time high. Jonathan Bown, assistant editor of Now celebrity magazine, said: “It’s now more about the journey than the destination. We love rooting for our favourites, but once we’ve chosen our winner, interest wanes very quickly” . Perhaps, in view of the proliferation of insipid material it would be more correct to use the term 3-minute wonders. Their disposability is heightened by the queues of hopefuls outside casting events for the shows, eager to fill the gap left by those whom marketing departments consider to be last week’s news. A poll by eMusic last week showed more than half of people questioned about the state of (the) British music scene cited The X Factor and Simon Cowell as having the most negative effect on the industry in the past 20 years. Far from music, the ‘star system’ seems to be what is really dealt with here: fame as an end in itself. They are not really selling the music, rather, the idea of being famous. ‘Disposable fame’, reaching levels surpassing even Warhol’s predictions, and dictated by the interests of corporations yet marketed with a veneer of viewer choice, would seem to be the order of the day. Fame as the highest value now having been dealt with, it is time to turn to the opposite end of the scale. The material presented here shares practically nothing with the manufactured fame society. It is that which has been consigned to the dumping ground: one-off home musical recordings, private performances made by completely anonymous people. In making these sounds public for the first time, each one is given its ’15 minutes of fame’, in an ironic reflection upon the processes described above. A whole new sonic environment is constructed where the individual musics ‘compete’ against each other. -Recordings found in Madrid, the place of the INC event. 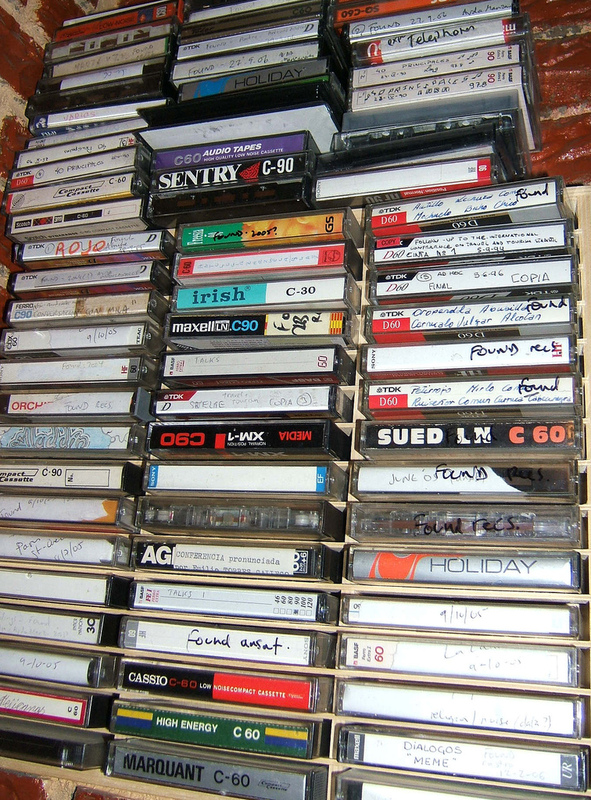 Physically it consists of 15 cassette recorders using their inbuilt speakers to play back extracts from 15 found tapes meeting the above criteria. Each cassette has 15 minutes’ worth of material, looped if necessary. The performance uses two amplified microphones, mic 1 set to pick up the sound from the individual machine and mic 2 the sound from the rubbish bin/box(es). Each machine in turn is switched on, plays 1 minute into mic 1, then is deposited, still playing, in the bin. The resulting mix of sounds is picked up by mic 2. The event ends when the last machine in the box has stopped. Alternatively the installation can be modified for looped playback (15 sets of 15 minute loops) over an indefinite period.